The Ogun State APC crisis over the emergence of Dapo Abiodun as a gubernatorial candidate has refused to abate. 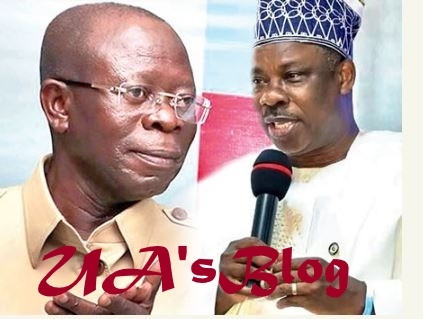 The crisis within the Ogun State chapter of the All Progressives Congress has worsened following the refusal of the National Chairman of the party, Adams Oshiomhole, to grant the request of the state governor, Ibikunle Amosun. The state executive of the party insisted it would only recognize Adekunle Akinlade as the APC’s governorship candidate and vowed not to work for its governorship candidate, Dapo Abiodun, in 2019 except President Muhammadu Buhari directed otherwise. Meanwhile, President Muhammadu Buhari has sent a reconciliation committee to the state to meet with the 26 aggrieved APC state assembly candidates to settle the crisis that emanated from the party’s primaries in the state. The Presidential Reconciliation Committee led by Sandra Oladele while addressing the aggrieved candidates said, “We are here for peace,” assuring that whatever happened, all parties would be reconciled. He added that the APC remained as one big family, irrespective of the differences and stressed that they had agreed to work together as a party. Speaking earlier, the Chairman of the APC, Ogun Central Senatorial district, Yomi Ademefun, who represented the state APC Chairman, Chief Derin Adebiyi, presented the position of the state APC to the committee members and demanded that the mandate of Akinlade and other aggrieved candidates for the Ogun State House of Assembly be restored.